A few weeks ago I saw a newspaper ad for a beer dinner at The Melting Pot featuring beers from Southern Tier Brewing. I've never eaten at the Melting Pot, nor have I had the opportunity to try many Southern Tier beers. This looked like a good time to change both of those conditions, so last night my family headed over to the restaurant and partook of the meal. As I said, we've never eaten at Melting Pot and didn't know what to expect. We ordered an extra plate of food for our son, and our beer dinner began. There was no printed menu to tell us what we'd be eating, or even how many courses to expect, so we just went with the flow. All of the beers were poured from bottles. The first course featured Southern Tier Oak Aged Unearthly Imperial IPA. The beer was paired with a chipotle cheddar, bacon, and garlic dip with honey-wheat and french bread. The beer was also used in preparing the fondue. The Unearthly Imperial IPA was tasty and paired very well with the spicy fondue. The beer has a bitter hop finish that, by the end of the course, was somewhat masked by the chipotle flavor in the cheese. The beer for the second course was described as "an unfiltered wheat with raspberry." We didn't see the bottle but I assume the beer was the aptly named Raspberry Wheat Beer. This was paired with a Strawberry Almond Vinaigrette salad. Neither Colleen nor I are big fans of fruit beers, and Colleen expressed some trepidation over this course. After our first sips of the beer we confirmed our feelings towards this style. 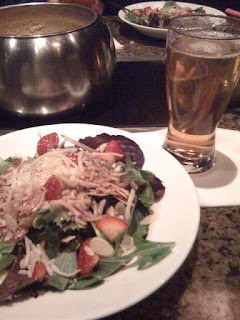 However, once we started eating the salad we found the pairing worked quite well, and we enjoyed the beer very much. For my tastes, fruit beers cannot stand on their own, they must be enjoyed with a proper food partner. Next up was the "main" course. This consisted of shrimp, pork, duck, and beef, along with a vegetable sides of potatoes and broccoli, and a pot-sticker. These were all to be cooked in a vegetable broth fondue. A large assortment of sauces were also served for flavoring the meats. The beer for this course was Big Red Imperial Red Ale. Our son's platter arrived at this time as well and we all got down to the business of "cooking." The big malt flavor of the beer is balanced by the bitter Hallertau hops, and was a fine match for the assorted meats. Neither food flavor nor beer overpowered the other. The final course of the evening featured Jah*va Imperial Coffee Stout. This beer is made with Jamaican coffee and chocolate malt. The beer was paired with an assorted dessert tray consisting of strawberries, brownies, bananas, chocolate covered marshmallows, rice krispie treats, and cheesecake. The accompanying fondue dip was comprised of melted chocolate and Kahlúa. This was accompanied by flaming brandy during the preparation. The Jah*va Stout was robust with strong espresso and chocolate flavors and could be described as "chewy". By this point in the meal we were all feeling quite stuffed and slowly picked at the desserts. This was a bold beer dinner for The Melting Pot to put on. Three of the four beers served were high in alcohol. The ABV ratings of the beers, in order served, were 11.0%, 4.5%, 9.5%, and 12.0%. And these weren't 2 ounce samples either! As much as it pained me, I chose to not empty my glass with each course, except for the Big Red Imperial Ale. The dinner was not a group event, but served individually to diners as they arrived. Each course was introduced by a description of the beer to be enjoyed. The service was prompt and efficient. It would have preferable to have had some printed information available on what foods and beers to expect. Perhaps the bottles could have left on the table for reference as well. In addition to trying out some new beers, we all enjoyed the fondue experience. We left the restaurant feeling very full after a tasty and fun meal. I understand that The Melting Pot holds regular events such as this. I did sign up for their mailing list so I should be hearing about future happenings. I expect we'll go back for another. I realized after we left that I never looked at the standard menu, so I don't know what sort of beers The Melting Pot usually has on hand. Does anyone know? I guess I could make a return visit, purely for research purposes. Mobile phone photos of the dinner here. Hey David, Was this Melting Pot located in Fredericksburg? I'll have to check out the one located near me and see if they have any dinners like that happening. Yep, the one here in Fredericksburg. I was surprised they had anything like this going on.